Magnus Carlson is the current world chess champion.He defeated Vishwanadhan Anand and grabbed the title.Though his exact birthtime is not available,I will try to analyse his birth chart according to Nadi Jyotish principles. He was born at Tonsberg in Norway on 30-11-1990 in Bharani star ruled by Venus.It was a Friday.So Venus will have a strong influence on his life.Among the chara karakatwas,Venus became the Amatyakaraka denoting profession.It is sandwiched between Sun on the back and Mercury and Saturn on the front and located in Vrishchika the rasi known for mystery and secret plotting.This combination could denote a porofession involving help from father,intelligent thinking and hard work. His Atmakaraka Saturn and Sun are vargottama indicating success in profession,good luck and name and fame.These two planets made him a child prodigy in chess. Saturn with Mercury gives deep thinking and meticulous intelligent planning.Mars and Moon in Mesha could give tenacity of purpose.Exalted Jupiter with Ketu denoting Moon could mean Gajakesari Yoga that boosts up good luck. Uranus and Sun in exact 2/12 position shows sudden flashes of intuition in times of need.Jupiter and Neptune in exact 6/8 position shows deep religious bent of mind and lots of fortune from the nether world. Natural Karma Karaka, the indicator of profession,is Saturn. He is with Mercury who is also the 3rd lord from Moon lagna.So a profession involving intelligent thinking and planning is indicated. Saturn gets 2nd and 3rd Lordship from himself.So the profession could be something connected to sports,writing and communication.Venus being Amatyakaraka could give modelling and income from advertising. Chess is a game that needs a lot of thinking,silent planning and intuitive ability.The role of Uranus and Neptune in this angle cannot be overlooked in Carlson's chart. By and large,a birth chart can be read by using Nadi principles even in the absence of correct birth time.Though minute details of life are not traceable by this method,the broad directions life could take in future could be easily gleaned through Nadi analysis. Sachin Tendulkar,the greatest batsman of modern Indian cricket has retired recently and has been given Bharath Ratna award.I will just have a look into his birth chart. Before proceeding ahead,I have to admit that I don't know the ABCD of cricket at all.I was interested in martial arts from my childhood and spent my hobby time in learning various fighting styles.I never played cricket or any other game seriously as martial arts consumed my whole attention for quite a long time.So my knowledge of cricket is almost zero.Therefore,I will just touch upon Sachin's major life events to the exclusion of the subtle nuances of his batting style or his career ups and downs. His date of birth is 24-4-1973 at Mumbai.Quite a number of times are available on the net each of them claiming to be his correct birth time.Some of them are 1.00 PM,2.47 PM and 4.20 PM.They give Kataka,Simha and Kanya lagnas respectively. Sun and Mars are exalted in his chart.Mars is karaka for aggressiveness.True to this trait,he used to bully his schoolmates.To curb this attitude and to channelize his excessive energy,his brother introduced him to cricket.Mars gave him an aggressive batting style.Some people say that he is a Kanya lagna native,as Mars could become 3rd lord only when the Lagna is Kanya.If this is true his time of birth could be around 4.30 PM.I dont know if this true. Exalted Sun bestowed upon him success in career,name and fame and great fan following throughout the world.Jupiter in fall made him a devotee of Satya Sai Baba.It is noteworthy that Jupiter is in Makara in Satya Sai Baba's birth chart also.Planetary synchronicity happens in various weird ways. Love marriage is possible for Karkataka and Kanya lagnas with this combination of planets.7th house becomes blemished for these two lagnas,Mercury in fall in 7th house for Kanya Lagna and Jupiter and Mars in 7th house for Kataka Lagna.Out of these two,Saturn being 7th lord in Labha stana gives a wife older in age.It could also give a doctor wife serving the sick.So I favour Kataka Lagna for him. Kanya lagna cannot give a good career as Ketu is in 10th house.Kataka Lagna on the other hand could give a very bright career as Sun is exalted in 10th house.So,Kataka Lagna gains strength.So his birth time should be around 1.00 PM.If that is true,at the time of his marriage on 24-5-1995,he was running Mars/Jup/Merc dasa(Vimsottari).Mars and Jupiter in 7th house and Mercury in Sukha stana from Moon could easily give marriage.So the dasa pattern too tallies for Kataka Lagna. Currently,he is running Rahu/Ven/Jup/Ket dasa.Venus with exalted Sun gave him the highest award of the country.However,Venus is a badhaka for this lagna and Jupiter in fall transfers this blemish to Mars who is the Karaka planet for sports and games.Ketu gives separation.So his retirement from Cricket tallies with the dasa bhukti pattern. Reverse Kalasarpa yoga as some would attribute to his chart,is a misnomer.There is no such thing called reverse KSY.It is a creation of modern false astrologers.His chart doesn't suffer from KSY at all. Let us consider the extra Saturnine planets.In my earlier days,I never used to consider them,as they were not mentioned in Indian astrology.But experience taught me otherwise.It is a fact that consideration of Uranus,Neptune and Pluto in astro analysis gives better insights than otherwise. Uranus in 3rd house sitting in Mars Star in exact trinal aspect to exalted Mars is the main reason behind his aggressive and unpredictable playing style mixed with good technique,which was complimented even by veterans like Donald Bradman.Pluto in 3rd house too supported him in his career. Neptune in 5th house could give love marriage among other things.Especially its position in Saturn's star could give a life partner older to him.This is proved to be true in Sachin's case. Ghatika Lagna in 3rd house shows name and fame in the field of sports.So I think his Lagna is Kataka which fixes his time of birth around 1.00 PM as per my perception. Planets rule over the mighty and the meek alike.None can escape their net.One cannot escape from one's own Karma either.This is as certain as tomorrow's sunrise. The world has now entered into a bad phase again, beginning from April 11th 2013.This bad phase will run for 43 days upto 23rd May.Let us look at the subtle nuances of this period a little closely. Rahu-Saturn combination is a very bad indicator as has been proved in many charts,both human and mundane.It triggers many violent incidents at mundane level too.Added to this,Mars and Ketu are now in Mesha exactly opposite to Tula. Mars-Ketu combination triggers excessive and uncontrollable energy. Rahu-Saturn yoga stirs up violent incidents backed by cruel plans. Mars-Ketu yoga piles up tons of raw energy.When these two forces align with each other,we can easily imagine what is going to happen,more so,when Mars and Ketu meet in a fiery sign like Mesha owned by Mars himself. On 11th April Venus moved to Mesha followed by Mars on 13th and Sun on 14th. Ketu has already been there since long.Now we will look at the trouble created by these planets at global level. On 14th, P.B.Srinivas a veteran south Indian playback singer and poet passed away suddenly at a ripe old age.He was not very ill,but died suddenly.He enchanted millions of South Indians with his melodious voice for decades. Yesterday, earthquakes rocked Iran,Pakistan and India. Mesha indicates Pakistan.It is 4th from Makara the ancient sign of India and 12th from Vrisha,the sign of Indian Independence.This happened on a Tuesday ruled by Mars. Boston is rocked by bomb blasts.Mars is ruler of sports and this incident happened during a marathon event. Fire broke out in Tirumala temple in India and could not be put off for about an hour.Exalted Sun indicates,inter alia,kitchens of holy temples. Untimely deaths are happening in many families from last week. Famous persons like Margaret Thacher and R.P.Goenka known for their iron will passed away. Gold and Silver prices plummeted,thanks to Venus the planet of precious metals, entering into the shadow of Ketu,scanned under Sapita Yoga from Tula. Now,these planetary influences will continue to haunt us till 23rd May.Let us try to pinpoint the probable dates which may trigger many more events of similar nature. 21st and 22nd of April. Venus-Saturn opposition.Mars combust. 28th and 29th of April.Sun Saturn opposition. Periods full of such ominous aspects are sure to trigger violent and chaotic events affecting nations in general and individual lives in particular.If you observe closely.you will see changes taking place in your life from April 13th. There are some cycles in Astrology which trigger 'draining' of global karma.During such periods,the planets especially Mars,Saturn and Rahu play active role and affect millions of lives in a drastic way paving the way for drainage of their long accumulated Karma.The phase we are passing through at present is one such. Let us observe suitable remedies,occult as well as behavioral,and sail safe through these turbulent times. By doing a post-facto analysis of events that are similar in nature, it is possible to know the Astro trends common to all of them. Once we know the 'modus operandi' of planets, we can project them into future for arriving at successful forecasts. Now let us look at past events of Bomb blasts that occurred at Hyderabad over the last few years. Degree conjunction of Sun and Neptune in Rahu star. Association of Mars,Venus and Mercury with them. Moon hora with aspect of Rahu-Saturn Sapitha yoga trigger. 11th day of waxing moon under the full moon shadow. 2nd day of waxing moon under new moon shadow. Jupiter went retro on that day and was in fall in D-9. 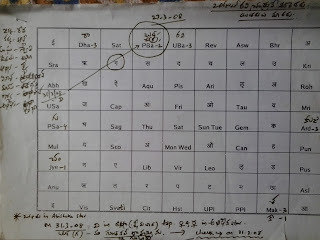 Lagna lord Sun in Vrisha in 6/8 degree aspect with Pluto in Dhanus. Saturn in Kataka in trinal degree aspect with retro Jupiter. Rahu in degree square aspect with Mercury. Saturn in 6/8 degree aspect with Uranus. Day is Friday.Venus in Rahu star and flanked by malefics. Venus hora ran at the time of blast. 12th day of waxing moon under full moon shadow. Neptune from Makara in exact opposition to retro Venus in Kataka. Gulika in Mesha in exact square aspect to Neptune and Venus. Day was Saturday and lord of the day was combust. Moon hora ran. Moon was with Neptune. It was with Rahu in D-9. Rahu opposed Saturn forming the infamous Sapitha Yoga. A creepy nexus among Uranus in Kumbha,Mars in Mithuna,Moon in Simha and retro Jupiter in Tula. The aspects were exact. 10th day of waxing moon under the grip of full moon. Day was Sunday.|Lord of day was exalted in Rasi but fallen in D-9. Mercury hora ran. Lord of hora was in trine with Mandi. Rahu aspected Saturn causing Sapitha Yoga. Retro Mars in Mesha in exact 6/8 aspect with Pluto in Vrischika. 10th day of waxing moon under full moon shadow. It was a Wednesday.Mercury was in Rahu star and trinal to Uranus. Lagna was 13 degrees Tula(in Rahu star) in exact trine with Uranus in 13 degrees Kumbha(rahu star again). Moon and Neptune are in same star. On 21.11.2002 a blast shook Saibaba temple killing 10 people on the spot.Let us look at the planets at the time of blast. Saturn is retro and conjoined with Rahu, hence Sapitha Yoga continues. Moon in Mrigasira ruled by Mars is in exact sextile aspect with Jupiter in Aslesha ruled by Mercury.Moon-Jupiter yoga created a blast in a sadguru's temple. Mars is with exalted Mercury in D-9 and aspected by Rahu.This combination could give rise to a perverted, adamant mindset very common to terrorists. Lagna lord was in 6th house of enemies in sextile aspect with Mandi from 4th house.This could mean the terrorists are local people. Day was Thursday. Hora was Guru hora.Jupiter was in Aslesha star ruled by Mercury and Rahu jointly. 2nd day of waning moon was under full moon shadow. All the blasts occurred around full moon or new moon.Here again,full moon effect is more prominent. Effect of Rahu on Moon and Mercury is evident.It suggests cruel temperament. Sapitha yoga was very prominent. Roles of Saturn, Mars and Rahu are clearly visible. Uranus,Neptune and Pluto played their part very well in each case.Though some astrologers believe that these extra saturnine planets need not be considered, I take the liberty to disagree.Earlier I too used to entertain similar view, but experience taught me that by including them in the analysis, more precise predictions could be arrived at. Role of the 'outer' planets suggests the role of 'outsiders' i.e foreign terrorists in the above blasts. Going by the above analysis, a clear-cut pattern emerges showing who among the planets are controlling the blasts. If we could project these patterns into future, there is more probability of forecasting future occurrences with greater accuracy. Yet another black day in the history of Hyderabad. Yesterday,around 19.00 hours,serial blasts shook the city of Hyderabad,Capital of Andhra Pradesh state in India.Many died,many were injured and many more were shocked. Statements flew from political leaders.There was hectic activity in the media and TV studios.Security was tightened. Despite all this,Hyderabad continues to live in fear.In fact it has become a regular affair for a Hyderabadi to expect some kind of mishap every now and then.A fearful question stares in his face "Is Hyderabad becoming southern Kashmir?" Let us look at the planets at the time of blast.The most notable clue is the degree conjunction of Sun and Neptune in Kumbha rasi.Of course, there are three more planets viz Mars,Venus and Mercury sitting in the same rasi and I will explain their significance in the following paras. Neptune is in Satabhisha ruled by Rahu.So he is colored by Rahu's sinister influence and acquires negative traits. Neptune's negative traits are Illusion,deceit and trickery,dreaminess,irrational behaviour and idealism. Sun represents Government. In Indian Independence chart he is the lord of 4th house and rules over citizens of India.That being the case, Sun conjunct negative Neptune indicates enmity with Government and people. The other planets can give rise to the following results. Mars: Being the ruler of violence and war, this planet can trigger violent incidents being provoked by irrational,ideal and trickery behavior of Neptune. Mercury:Association of Neptune with the lord of intellect results in loss of reasoning power.For the criminals this may provoke thoughtless action and for the police,dullness of intelligence. Venus:The Lagna lord of India was in zero degree at the time of blast and hence was very weak. So India became an easy victim to the sinister plan of criminals. At the time of blast,Moon Hora was running.It is aspected by Rahu and Saturn constituting Shapitha Yoga or Cursed Yoga.The results of this yoga can be very disastrous as in the present case.In D-9 Moon is with Rahu. Sun and Neptune are in Dhanus in D-9. This bhava is 8th from Vrishabha, India's Lagna denoting destruction and loss. So going by the above analysis, Sun conjunct Neptune in Rahu star and in the company of Mars triggered the sad incident. Shapitha Yoga in 6th house of enemies in India's chart added fuel to fire.But then,India in general and Hyderabad in particular must have an affinity with this planetary pattern to trigger this kind of violence.May be, further research with the help of astro-cartography may help in pinpointing this factor. Keeping astro-analysis aside, will India ever learn the lesson to deal with the perpetrators of terrorism in a fitting manner?